WIN family passes to the movie premiere of Peppa Pig: Festival of Fun! And you could win tickets to the movie premiere for the family. Exciting! 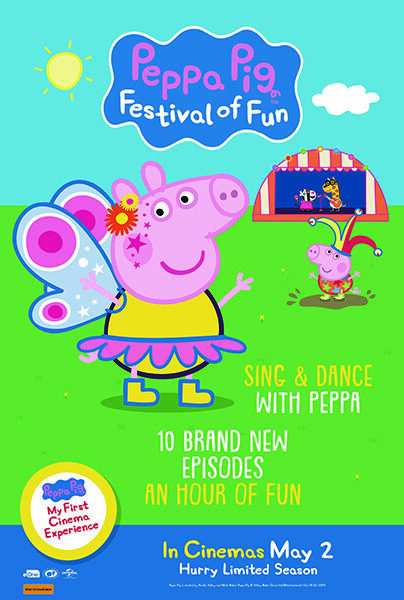 Peppa Pig: Festival of Fun opens in cinemas from 2 May. The hour-long movie gives preschool audiences ten new episodes featuring a two-part festival special, complete with new characters. Your little piggies will enjoy a whole hour of snorts and giggles with songs to sing along to and dances and movements to join in with; making it the perfect cinema outing for preschoolers and all the family to enjoy. Each of the ten brand-new episodes will be connected with never-before-seen interactive entertainment featuring little ones singing and playing along with their favourite onscreen characters. Thanks to eOne and Universal Pictures, we are so excited to be able to offer Babyology families 5 family passes to each of the movie premieres in Sydney, Melbourne, Brisbane, Adelaide and Perth on Sunday 28 April – so that’s 25 family passes in total. So much Peppa fun to be had! So get in quick and enter our competition below for a chance to win. This competition closes at midnight 23 April 2019. Check the T&Cs for details.